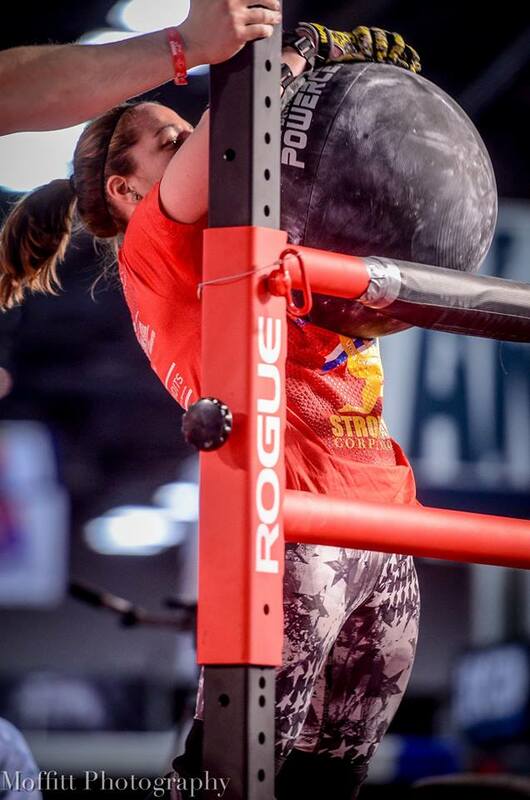 I went into this year’s Arnold with one major goal in mind: to improve my mental game. Last year, at my first Arnold, I felt that I needed to prove that I belonged there. This led me to compare my training to every other qualified athlete and wonder why I wasn’t doing as well. As you can imagine, this did not lead to a desirable outcome. This year, I promised myself that I would be calm. Throughout my prep leading up to the contest, I focused on my own training and wasn’t comparing myself to anyone else. I finally figured out that what someone else was doing in training wasn’t going to change what I am capable of. I left Wednesday night to get to Ohio, driving all night with my boyfriend, mom, and aunt. We arrived at about 7 am, so I got straight in line for weigh-ins. Thankfully I didn’t have to cut weight, so the drive wasn’t so miserable. During weigh-ins, we picked our order number for the first event, which was different than it’s been done in the past. As luck would have it, I pulled number 1. Normally, that is the exact opposite of what I would hope for. However, given that pressing is my most mentally difficult lift, I think that going in the first heat was the best option for me. And, as a friend pointed out, if I go first, then I start out in first place! The first event was the log press. Clean and press a 145 pound log for as many reps as I can in 60 seconds. This was the event I was most nervous about. Warm ups felt pretty solid, and I was confident that I would hit my goal of 5 reps. In the time leading up to the first heat, I was a little more jittery than I would have liked, but given that it was the first event, and it was pressing, I kind of expected that. Finally, after what seemed like forever, they were calling everyone out for heat 1. I felt focused and ready. The whistle blew and I cleaned my first rep. It felt a little heavy at my chest, but I tried not to let that phase me. I went for the press, but couldn’t lock it out. I think I pushed it too far forward. I had not anticipated failing my first rep. I wasn’t anticipating a struggle until at least the 3rd rep. All I could do was refocus and try it again. I took a breath, cleaned the log, and went for another press. I threw it forward again, but this time I was able to correct it. It wasn’t pretty, but I got the rep. That right there was my biggest victory of the day! A year ago, after failing my first press, I probably would have zeroed the event. My goal of being mentally stronger this year was paying off. I was able to struggle for 1 more rep. I tried for a third, but couldn’t quite budge it off my chest. Even though I fell shy of my goal, I didn’t come off the floor angry. I was really proud that I was able to recover from the first failed press, and that victory kept me positive. It seemed that I wasn’t the only one who struggled more than expected on this event, however, because my 2 reps got me a 3 way tie for 3rd place. My goal for pressing was at least top 5, so I was off to a solid start. 14 of the 20 women in the light weight class zeroed the log. I knew that was going to drastically affect how the points played out for the rest of the day. I was pretty confident going into the frame carry. I’ve practiced on the Beast Metals frame at Lightning Fitness, and felt solid in my times. I wasn’t anticipating a win in this event, but I knew I could finish towards the top. Warm ups felt good and quick and I was ready to go! When the event started, my pick was a little shaky. I gripped too far back, so the frame rocked and slowed me down for the beginning of my run. I could also feel the left handle slipping slowly out of my hand. I quickened my pace, held on for dear life, and finished the event in 5th place. My goal was 8 reps. I had hit 7 in training, and knew I could pull at least 1 more. When my heat was ready to start, I strapped in and tugged on the axle to make sure I was centered and my hands were in a good spot (I had that issue last year… I strapped into the axle way too narrow and my hands got stuck on my legs). The whistle blew and I started pulling. My reps felt easy and solid. I started my count down from 8, but started thinking that I could get 10. As I got to rep 6, I could feel the struggle starting. I lost all technique, and locking out my hips was rough. By the time I was starting my 8th rep, there were only 10 seconds left. It was a long struggle, but I got that 8th rep. When I got the down command and let out an excited scream. I hit my goal and I knew that it would be a good score. 8 reps was a tie for 4th in that event. When the score sheet was updated, I started to cry. I was going into the last event of day 1 in second place. My goal of getting to the main stage was in reach. I really had to focus on this event. I knew it was my strongest day 1 event, but I needed to make sure I didn’t psych myself out about making it to the finals. I took some deep breaths, visualized my runs, and didn’t watch anyone else. I picked up the 120 keg, found a good position and started running. I could see the competitor to my right getting ahead of me. I tried to make up for it on my run back, but I slowed down too early because I was worried about slipping on the slick floor. I caught up to everyone by the end of the 140 keg and tried to keep pace on the run back. I grabbed the 160 sandbag and it went up easy! I started running and didn’t see anyone moving on either side of me, which was a good sign. I dropped the sandbag on the mat and realized I won the heat. Given that my heat was the top 4 women, I assumed beating them would solidify my spot in the finals! Unfortunately, I had some time to wait before I could find out. When the scores were finally posted (it seemed like forever to me, but I know they were working hard and fast to get the scores out! ), I was in first place! I couldn’t believe that I was not only going to the finals, but I was going in 1st place. I did my best to relax on Saturday and enjoy myself. We went to the convention center to visit some booths and then we watched some friends kill it at the XPC Powerlifting meet. On Sunday, I ate a nice, filling breakfast, because I knew I wouldn’t be able to eat lunch. Then, the time for events rolled around. 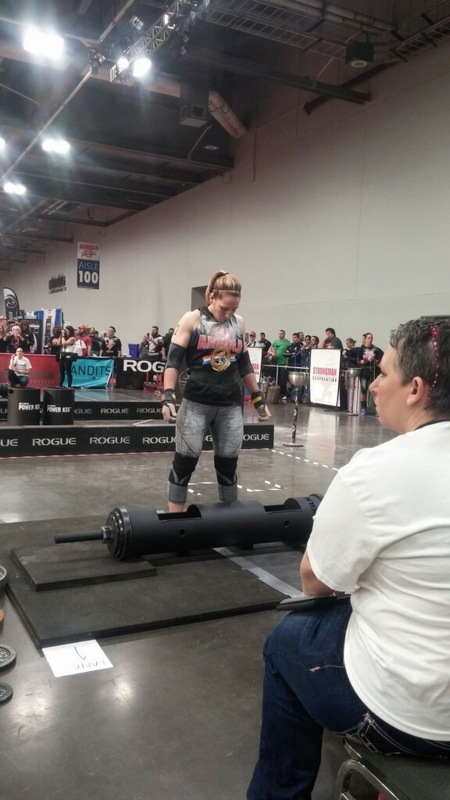 I was lucky enough to have a gym in my state who ordered the Stone of Steel after events were announced. Thank you Lightning Fitness! Stones are my favorite and best event, but I knew that the Stone of Steel would be a whole different ball game. My best in practice was 5 reps in a minute, and that was a struggle. When I went out for my heat, I asked the judges what the number to beat was. They told me 5. I had a lot of work to do. I loaded picked the stone, and it couldn’t have felt better! I think it was a combination of my adrenaline and the fact that the stone was loaded evenly (I don’t think I ever loaded it evenly when I trained with it). By the time I hit my 5th rep, I was still feeling strong. I hit a 6th and heard them call out 10 seconds. I wasn’t sure how many Jess had done right across from me, so I quickly grabbed the stone and loaded one more in the last few seconds. I got 7 reps for the event win! My plan going into the frame hold was to pick it up and start counting down from 30 second increments. That plan changed when I saw the first 2 girls go and drop within 5 seconds. Damn we must be shot if a 370 frame hold is that hard. I went out, grabbed the frame, and almost immediately started shaking. I started my countdown from 10. I think I actually made it to 1 before I dropped… but my time was 8.31 seconds. I counted way too fast! It was enough for second place, though, and that was all I needed for the contest win! Even when they announced the placings, it was difficult to wrap my head around. I am 100% positive that my mental strength this year got me to that main stage and first place finish. I felt calm, confident, and strong during both days of the competition. Last year, although I knew I was physically ready, I was not calm or confident at all during my performance. Now that worlds are over, I am getting back to training to work on my weaknesses from the weekend. I can’t wait to get back to the Arnold next year, stronger than ever, and defend that title! I am a high school English teacher in Bridgeport, CT. I was a cheerleader through college, and that is what eventually started me in weightlifting. My boyfriend convinced me that lifting weights would make me better at tumbling for cheerleading. We did the first Couples Strongman Challenge at Lightning Fitness in December 2012. I was hooked. I competed at Battle of the Belles in October 2013, qualifying for 2014 nationals. I placed 2nd, and went on to my first Arnolds in March 2015. I placed 9th, and vowed to come back stronger than ever in 2016. I went back to nationals and placed 4th, qualifying for worlds again. I trained hard, worked on my mental game, and came out with a win at the Arnolds 2016. I look forward to seeing what the next year of training brings!